The SENTINEL is a solid-state, polyphase meter designed for use with your high-end commercial and industrial (C&I) customers, including large industrial sites and substations. The ITRON Sentinel series meters are solid-state, electronic, multimeasurement, polyphase meters of exceptional accuracy. 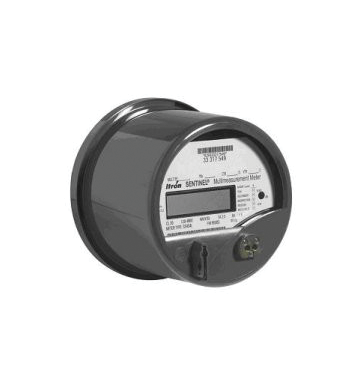 These self-contained or transformer-rated meters are designed for use in commercial and industrial locations, including large industrial sites and substations. An advanced analog-to-digital sampling technique samples each incoming current and voltage waveform 32 times per cycle (60 Hz). Voltage and current values are calculated every 2 cycles using true Root Mean Square (RMS) calculation. Volt-amperes are calculated by multiplying the RMS voltage value with the RMS current value, thus providing an arithmetic calculation for VA. The Sentinel meter also allows for a vectorial calculation of VA.